Raise your forks! 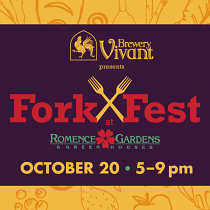 Guests will have the opportunity sample delicious bites, treats, and sips from over 40 of West Michigan's finest restaurants, farms, grocers, bakeries, breweries, and more. All samples are included in the price of admission and a cash bar will be available. NEW THIS YEAR! Louise Earl Butcher will provide an on-site butchering demonstration! More information and full list of vendors at localfirst.com/events.